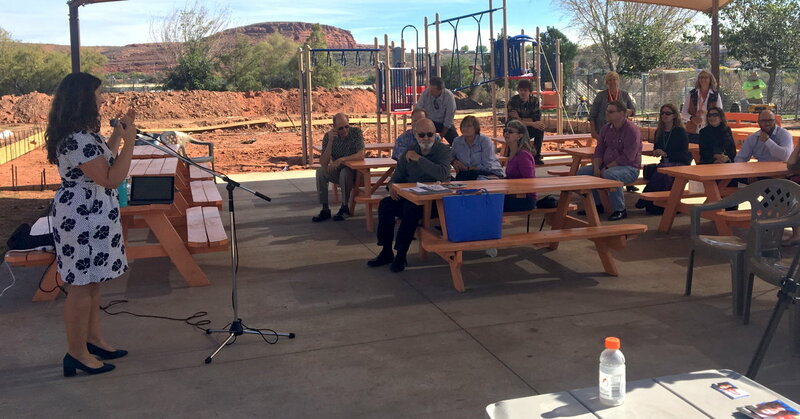 ST. GEORGE — Wanting to hear from those facing homelessness while also showing them there is a potential future member of congress who listens to their issues, Democratic congressional candidate Shireen Ghorbani held a town hall meeting Monday at the Switchpoint Community Resource Center. Instead of passing policies that help empower the homeless, Congress ends up empowering the rich and corporations instead, she said. Ghorbani is running for Utah’s 2nd Congressional District against incumbent Republican Rep. Chris Stewart. Three primary areas that need to be addressed in order to combat homelessness and poverty are having stable jobs and livable wages, having more affordable housing and access to affordable health care, particularly in relation to mental health and addiction recovery. “This is one of the big challenges facing our community, whether it’s in Salt Lake City or St. George,” Ghorbani said. Access to affordable health care holds personal importance to Ghorbani as she talked about how her late mother had been diagnosed with cancer in 2016 and the heavy financial toll that created. She also said her father had been an alcoholic with addiction issues who lost his job and home because of it. Ghorbani’s father would end up checking into a homeless shelter where he was able to access addiction recovery services and “got back on his feet,” she said. If mental health and addiction recovery services are not made more readily available, then those facing homelessness, as well as those who may find themselves caught up in the criminal justice system, won’t be able to break the cycle they’ve fallen into, Ghorbani said. As for affordable housing, Ghorbani knew it was an issue in northern Utah, yet hadn’t known it extended to southwest Utah until she started campaigning, she said. Finding housing for those facing homelessness has been an ongoing issue in St. George and elsewhere as many find rental rates to be beyond their ability to afford. “There are very few places available to rent, and those that are available are very expensive,” Ghorbani said. As a way to try to alleviate the issue, Switchpoint has been involved in the creation of the RiverWalk Village project, a 55-unit apartment complex that will offer affordable housing to those who qualify. The project has been in the works since 2016. Carol Hollowell, Switchpoint’s executive director, said she was happy for the opportunity to host a town hall at the resource center. 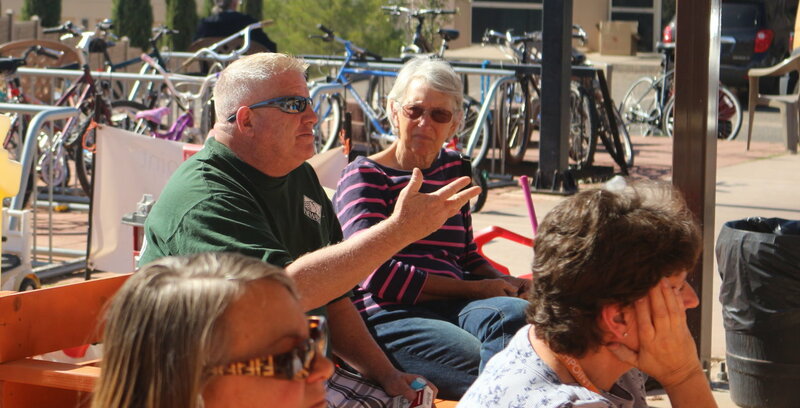 There were at least 10 Switchpoint residents sitting among those who attended to town hall meeting, Hollowell said. Since its opening in late 2014, Switchpoint has sheltered an estimated 4,100 individuals. As for how many people have been able to take advantage of Switchpoint’s services, Hollowell said is that estimate is about 14,000. Ghorbani and her campaign staff toured Switchpoint during a stop in St. George over the summer. Monday’s visit to Switchpoint brought a close to a series of town hall meetings held by Ghorbani’s campaign. Previous town halls tackled the issues of education, health care and criminal justice reform. Do you really think the republican party has your best interest in mind? Supporting Trump is supporting hate and bigotry. Do you really think the tax cuts are about anyone but the rich?, Do you really think the tariffs help us? Trump is a businessman and he only cares about expanding his brand and making money. I really hope for the sake of our country that the people who support Trump open their eyes to this idiot. How many times does this guy have to prove how stupid he is before people realize they have been duped. No filter, even though I voted for Trump, I did it because he was the lesser of two evils. Hillary would have been a far worse choice, so voting for her wasn’t even an option in my mind. Seems like I wasn’t alone in my thinking, being that Trump is now President. However, if someone better than Trump comes along in 2020, I would gladly vote for them, but I guess it’s too early to know who’s going to be running in 2020 so we’ll see. Switchpoint has done great things to help out in this town. Bu s much to do,, and I know some people choose t9 be homeless to avoid, taxes, alimony, and work.. but remember Trumo is wealthy only because his father left h8m with the legacy, he does not care for the poor or middle class even.. now he is trying to give tax breaks to middle class just to get republicans elected..
democrats have always helped the middle class and poor, remember social security, and Medicare came about by Democrats.. The new living apts, will help, and I hope businesses will do their share of hiring these people..
Democrats do help the poor, but the problem is they cater to those who want handouts. Money is being taken out of our paychecks to support people who are able and willing to work, but choose not to. Until the Democratic party changes their tune on this, I can’t possibly support them. Many feel the same way. The dems have some good ideas as they wish to be cognizant of those in unfortunate situations. Unfortunately, my observation is that they want to add all kinds of benefits to others while making those who are working pay more taxes to cover the costs. They advocate certain issues, such as open abortion paid for by the public (even late-term), allowing illegals to get into or remain inside the US at a heavy cost to the citizens, getting rid of the death penalty, allowing fully-functional boys to shower next to young girls in middle school and high school locker rooms, forcing bakers to make cakes advocating practices that go totally against their moral beliefs, etc. I am not totally happy with the package offered by Republicans either. The best answer is an Independent who can choose the best from both parties with obligation to either. A handful of them could have the power to look carefully over the issues and not be forced into a biased vote based upon what their party leaders demand. Those few could restore power to the people and take away the ability of one group or another to run things one-way.